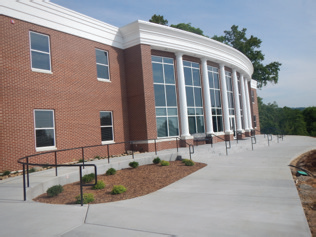 Located in Collegedale, Tennessee, Southern Adventist University consistently ranks in the top tier among Southern Regional Colleges in the United States. Its beautiful campus boasts a landscape well known for its design and impeccable maintenance. In 2010, the Landscape Services team selected Spray-Lock Outdoor Concrete Protection® Technology (SCP) as part of its maintenance system. Spray-applied at time-of-placement, SCP Technology provides a fast, superior cure equal to or exceeding water ponding. On application to rough finish concrete, SCP Technology penetrates and reacts to form a gel within the concrete capillary and pore structure. It reduces water migration levels and can prevent dirt and other debris from collecting in the pores of the concrete. By protecting the concrete against de-icing chemicals and salt damage, the need for costly repairs is reduced, lowering maintenance costs. With SCP, foot traffic is accessible to most flatwork in 1-hour. In really dense concrete or extremely high moisture conditions, it may take up to 3 hours. 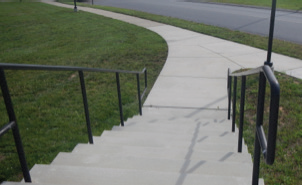 In 2010, SCP was applied on steps and sidewalks outside the student housing at the University. Four years later, the difference in SCP-protected concrete and untreated concrete is visible.